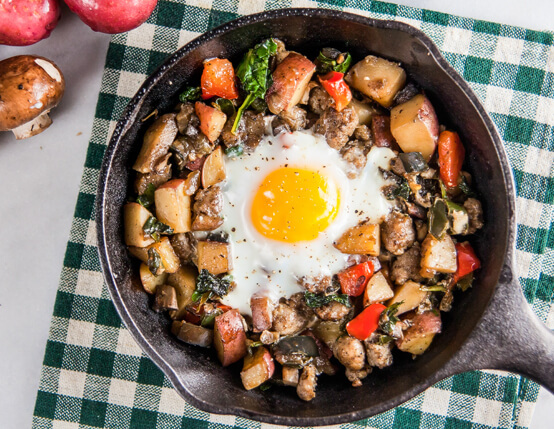 If you like to stock up on veggies, then this is the hash recipe for you. 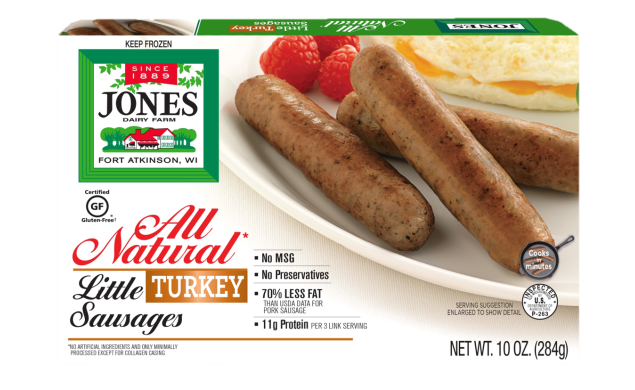 This recipe is made with Jones All Natural Turkey Links. Remove the sausage form the casings. Crumble into large, oven-safe pan (preferably cast iron) set over medium-high heat. Cook, stirring occasionally, until sausage is golden brown and cooked through ​- about 8 minutes. Transfer sausage to plate. Return pan to stove and reduce heat to medium. Add onion and garlic; cook 1-2 minutes. Add potatoes, poblano, and red pepper; cook until potatoes are browned and crispy ​- about 10 minutes. Stir in eggplant, mushrooms, and water. Cook for 10 minutes, or until water is evaporated and vegetables are cooked soft. Stir in kale. This was one of the best (and complete) breakfasts I've made in a while. I went with turkey bacon instead of turkey sausage and sweet potatoes instead of red potatoes. Feeling adventurous? Add a jalapeno for some extra zing!